When it comes to long-term care (nursing homes) and assisted living facilities, it can be difficult to differentiate the two based on name alone. Both provide medical care and housing, but the similarities often stop there. In this article, we’ll look at the specific differences between both senior care options. But first, here’s a quick overview of long-term care and assisted living. Long-term care facilities (LTC) provide medical aid and assistance for elderly adults that are unable to live independently and look after themselves. They’re designed to support senior adults with a prolonged physical or chronic illness, cognitive disorder or disability that needs ongoing care. As such, a LTC facility is equipped with a professional team of nurses, and 24-hour care for residents within a safe and secure environment. Assisted living facilities are designed for senior citizens who would like to enjoy their independence and privacy, while also having the benefits of daily self-care assistance. General assistance includes meal preparation, bathing, and taking medicine at the appropriate time. A long-term care facility provides robust, around-the-clock care for its residents. Those who have dementia (which amounts to nearly half of all nursing home residents), or cognitive impairment, receive the attention that is required. This means LTC facilities have a larger staff of medical professionals compared to assisted living establishments. Medical staff range from physiotherapists and occupational therapists to on-call doctors, nurses and eye and ear specialists. Assisted living offers basic self-care and assistance, and facilities are not required to have skilled nurses as part of its staff. Residents are capable of maneuvering through life without 24-hour aid while enjoying the benefits of cooked meals, clean housing, and regular checkups. The rooms of a nursing home are more akin to those found in a hospital. Rooms may be shared between two or more adults and are equipped to handle medical emergencies. Assisted living facilities offer more privacy, in that each occupant has a personal room that’s more like an apartment. This living arrangement creates a close-knit community, where residents feel safe and secure, yet can maintain a sense of independence. Long-term care facilities are primarily focused on providing aid, treatment, physical therapy and emergency medical assistance at any time of the day. As such, while they will work to offer therapeutic activities to enhance the residents’ quality of daily living, they are less likely to offer events outside of the facility. 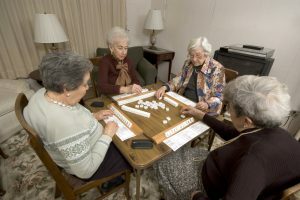 Residents of assisted living facilities are typically able to participate in a broader range of activities. Depending on the facility, assisted living can offer movie nights, singles outings, yoga, a communal dining room, expeditions and more. Medicare, Medicaid, and certain insurance providers may cover the expenses of a nursing home—as long as the occupant meets specific requirements. A 2016 survey listed the average nursing home cost between $6.8k-$7.7k a month. Assisted living, on the other hand, operates under a private pay system. Residents pay a monthly fee that can range between $2.5k-$7k a month. The “best” option depends entirely on the needs of each individual and their circumstances. A long-term care facility offers the necessary support for those who need frequent medical care and attention, while assisted living provides more privacy and independence, along with essential help for day-to-day needs. Both are beneficial. To choose the best option, examine the health needs of the individual. Then weigh the pros and cons, such as cost, medical coverage, insurance, and duration.